Upon looking at an axolotl for the first time, one might wonder exactly what kind of creature it is. With its catfish-like shape, the odd, frilly appen­dages emanating from its neck, and its fins, limbs and feet, should it be classified land- or water-dweller? It has gills, and can clearly breathe underwater. But watching it walk across the bottom of an aquarium tank, it is no surprise that it is commonly referred to as the ‘Mexican walking fish’. So should evolutionists take heart that here is something like a living ‘transitional form’, perhaps on its way to evolving from a fish to an amphibian? Not at all. The axolotl is, in fact, a salamander, placed in the same amphibian group with frogs and toads. Like all amphibians (and unlike all fish), the limbs are firmly attached to the vertebral column. Its scientific name is Ambystoma mexicanum. The name ‘axolotl’ is derived from the Aztec nahuatl, which means ‘water dog’. As an adult, the axolotl can reach a length of up to 30 cm (12 inches) and weigh over 300 g (10 ounces), making it a fairly sizeable amphibian. It tends to have a light cream to tan colouration in captivity, with a more mottled black-and-green colouration in the wild. But it can also appear tan, grey, brown, albino or even transparent (so one can see its internal organs). If properly cared for, it can live for up to 12 years. 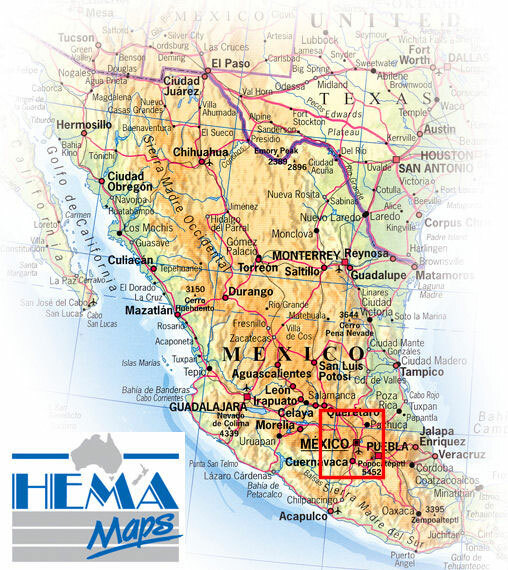 This odd amphibian is quite rare in the wild, existing in only one place in the world—Lake Xochimilco in Mexico (see map opposite page). 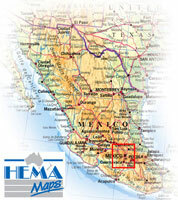 Realizing this, the Mexican government has protected the area around the lake in order to preserve the axolotl. Fortunately, it breeds well in captivity, so though it is on the CITES3 list of endangered species, there are enough specimens in captivity worldwide to ensure its survival. Though people and most animals are able to sufficiently heal a cut, replace portions of dead or damaged skin, or even regenerate a small part of an internal organ, axolotls are virtually unique among vertebrates in that they can completely regenerate entire limbs and organs. Instead of merely forming scar tissue over a wound, as most vertebrates do when healing, the axolotl can regenerate entire body parts, including whole limbs, gills, eyes, kidneys, even large portions of its liver and its heart muscle. If it loses its tail, it can eventually replace it—skin, muscle and all.1 Even portions of its spine and brain can be regenerated, something which is a near-impossibility with almost every other vertebrate. Parts of other axolotl embryos can even be spliced onto others. Eng, C., Axolotl health, <www.geocities.com/Yose mite/4301/axolotlhealth.htm>, 8 December 2004. Pickin, L., Keeping axolotls, 8 December 2004. An amazing ability of the axolotl is its fantastic regeneration and healing capabilities (see box at left). It can replace significant portions of its body if damaged. For this reason captive-bred individuals are extensively used in laboratory testing, as scientists have hoped to unlock the secrets of its radical healing abilities. By far the most unusual aspect of this salamander is that it retains its larval form into adulthood. So, unlike most amphibians, which metamorphose from water- to land-dwelling as they grow, the axolotl retains its gills and fins instead of exchanging them for developed lungs and limbs. This abbreviated developmental condition is known as ‘neoteny’, and the axolotl both thrives and breeds in its larval state. Stranger still, it can be forced to complete its larval stage and transform into a normal adult salamander by applying the metabolic hormone thyroxine.4 This causes the gills to be absorbed into the body and the lungs to fully develop, as well as causing the eyes to develop eyelids like surface-dwelling animals. It can also transform itself if it leaves its watery environment for an extended period of time, especially if its surroundings are too dry. Evolutionists sometimes refer to the stunted, normal adult form of the axolotl as a ‘backward step in evolution’. Supposedly, this amphibian was originally a largely land-dwelling salamander. Instead of going onwards to evolve into reptiles (then mammals, as the belief goes), one group of these allegedly returned to the water in a gradual fashion and are now caught in-between stages of development. However, the evolutionary literature is oddly reticent about exactly how or why this happened. The creature would have had to abandon the alleged advantages of leaving the water to begin with. As far as the facts go, axolotls have fully-formed limbs, gills, eyes, etc., and these function perfectly adequately for their purposes. The unusual features of the axolotl also present no problem to creationists. Since it can breed with certain other species of amphibian, such as the tiger salamander,5 it certainly would have come from the same original created kind as these. In fact, by the usual scientific definition, the two should be placed in the same biological species. If the characteristics peculiar to the axolotl did occur, say, from changes through its surroundings after it was created, then these changes only sorted out and relied on information and mechanisms already present in the animal; no additional information was added. It is possible that the selective effects of the isolation of its gene pool (particularly considering that the axolotl is so isolated in Mexico) caused its arrested development. This separation might have occurred immediately after the Flood, when the waters receded and stranded different aquatic animals in lakes around the world. 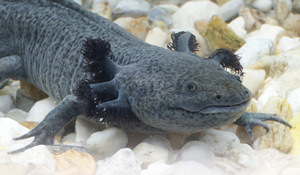 If, during the Flood, the axolotl was in the form that it is today, then it very likely could have survived the Flood totally submerged without any adverse effects. If the conditions are right, a mature, adult axolotl can spon­taneously metamorphose from a water-dwelling animal to a land-dwelling one. Over a period of up to several weeks, it will gradually absorb its gills back into its body, while its rudimentary lungs are simultaneously strengthened and enlarged so they can breathe oxygen from the atmosphere. Also, its tail changes from being flattened like a tadpole’ to being more rounded like that of a true adult salamander. Its skin becomes tougher and dryer as it begins to adapt to living out of water, and it will also moult its skin as a surface-dweller. Eventually, its eyes will begin to bulge out and develop eyelids, while its skin will often become more vivid and colourful after it makes its terrestrial transformation. Unfortunately, axolotls which make the incredible transition to land as an adult often experience a shortened lifespan, presumably due to the stress of transformation. Of course, this amazing change has nothing to do with evolution; the potential for it is all there, preprogrammed in its genes. McLeod, L., Introduction to an unusual salamander, 8 December 2004. Dice, University of Kent, Aztecs and axolotls, 18 January 2005. Convention on International Trade in Endangered Species. Eng, C., Axolotl habitat, ‘Artificially induced metamorphosis’, 8 December 2004. Rhudy, R., Robyn’s salamander and newt page, ‘Axolotls’, 8 December 2004. Woodmorappe, J., Noah’s Ark: A Feasibility Study, Institute for Creation Research, California, USA, pp. 153–154, 1996. A few days ago several executives were given a tour at a science museum in Barcelona, Spain. To my surprise, I saw a living fish with four legs walking on the bottom of an aquarium. Adjacent posters show artist renderings of how such creatures evolved into amphibians, then reptiles and finally mammals. This was a powerful image and disturbingly effective. 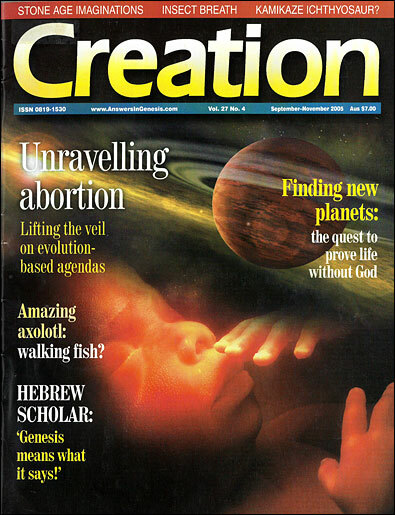 Returning home I saw in the Sep–Nov 2005 issue of Creation the exact same ‘fish’. Aha, it is not a fish at all, but an axolotl (Ambystoma mexicanum), a salamander arrested in its larval stage! Such a creature did not evolve into an amphibian, it is an amphibian! 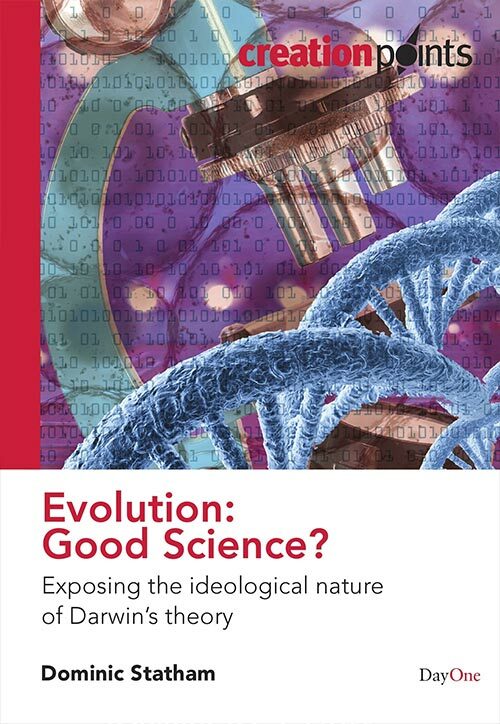 It cannot serve as an example nor illustration of evolutionary theory. I contacted the museum, and they confirmed the identity of this creature, and the fact that it should not have been labelled as a ‘fish’. Your magazine is an indispensable source of information to inform us how to respond to persuasive, yet incorrect, evolutionist claims. 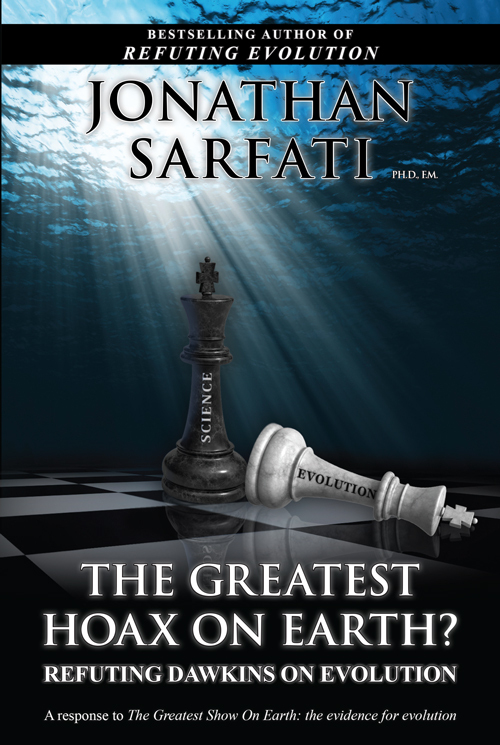 Thank you too for using Creation magazine to correct evolutionary misinformation.